Position of the shooting hand before releasing: Is the middle and/or index finger in the middle of the basketball? To be honest with you, I don’t know where those fingers are. All I want is for your hand to be behind the ball (as opposed to on the side) and in the same place every time. Again, it is a feel thing. I do not get into the really picky little things, such as what direction your fingers face or making everyone put there hand in the same place. It will be different for different people. I think that the most damaging aspect of any skill, which coaches seem to add to, is “analysis paralysis.” That is a saying where you worry so much about the little things, you examine what you are doing so much that you paralyze yourself and can’t perform the skill at all. I prefer to remain focused on the big picture. If adjustments need to be made, make them generally. For example, I will say, “put your hand under the ball,” instead of “put your hand here.” I want players to shoot the basketball without thinking of anything. The more minute you get with technique, the more they think about and the less effective they become. To become a better shooter, you need to practice smart. And just as important, you need some good basketball shooting workouts that actually make you better. Too many players practice aimlessly without an intelligent plan. You can get an edge on your competition by practicing smart and following a logical plan! 1 – Set goals based on number of shots (or makes), NOT time! You could literally practice for an entire hour and only take 100 shots. That’s not enough and you might be neglecting certain types of shots that are important. If you just go to the gym with the idea that you’ll shoot for an hour, then you’ll discover that you waste a lot of time dribbling around. You just don’t get in a good workout. All the pros and great shooters set a goal for a certain number of shots, no matter how long it takes. You can set your goals based on “makes” or “attempts”. It’s really up to you. It’s more challenging to base your workout on “makes”. So if you’re looking for a challenge, that’s the way to go. The key is to get to enough of shooting repetitions. You should shoot at least a few hundred shots at each practice session. Setting the right goal will help you get in the reps! 2 – Chart your progress. To improve your confidence, start charting all of the shots that you take in practice. It’s easy to do and you’ll be absolutely amazed at how much it helps. After every practice session, keep track of what kind of shots you took, the number of shots taken and the number of shots that you actually made. Take the time to develop a basketball shooting chart, because it really helps. 3 – Work on each type of shot. Stepping into your shot from both directions (right and left foot). Various ranges that are games like shots for you. Shooting from a “jump-stop” (only if you have mastered the step-in technique or if your coach directs you to use a jump-stop motion). 4 – Go at Game Speed. If you don’t go at game speed in practice, then your shooting percentage in games will be lower than it should be. If you have ever played, you will understand the actual speed of a game. 5 – Shoot game-like shots. Shooting game-like shots may be completely different for two people on the same team. One player may take the majority of his shots flashing to the ball from anywhere within 12 feet of the hoop. Another player may take the majority of his shots from 15 to 20 feet. That’s why it’s important to meet with your coach and ask what type of shots you’ll take within the offense, so you know what you should practice. 6 – Gradually move back, working on all ranges. Don’t neglect mid-range shots. Too many players have holes in their game because they don’t practice mid-range shots. Michael Jordan made a living off mid-range jump shots. 7 – Incorporate free throws into your routine. If you get winded, catch your breath by shooting a few free throws. This is a good way to manage your time effectively. You’ll get more done, in less time! 8 – Use chairs to help you practice footwork and simulate game-like conditions. You can easily simulate game like situations (dribbling around defenders, running around screens, etc) by using chairs. If you have a partner, you can still use chairs. The player shooting the basketball gets his own rebound and passes it back to the partner standing by the chair. The partner places the ball on the chair. The shooter continues the same pattern on the opposite side. If the shooter misses, rebound the shot and finish with a lay up. For more chair drills, see the basketball shooting drills in our full blown shooting course. At the beginning of your workout, you should focus on shooting form for a little while. This will help to keep your mechanics from slowly drifting in the wrong direction. 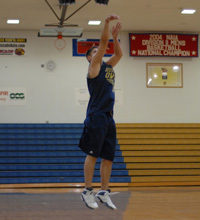 Shoot the ball one-handed away from the basket (this can be to a partner, line on the floor, or spot on the wall). Groove your shot to build confidence and positive mental images. Of key importance is starting each and every workout with at least 50 shots close to the basket to groove your shot. No matter what else you include in your routine, don’t leave these easy shots out! So, at this point, you should shoot using your normal two-handed grip (shot and balance hand) up close to the basket. These are supposed to be easy shots. Now you can gradually move back and work on various shooting situations. Spin-flip the ball to yourself, as if you’re catching a pass and shooting. Mix up shots from different angles and distances — top of key, right elbow, left baseline, etc. Shoot 25, 8-foot jump shots, stepping in with left foot pivot. Shoot 25, 8-foot jump shots, stepping in with right foot pivot. Shoot 25, 12-foot jump shots, stepping in with left foot pivot. Shoot 25, 12-foot jump shots, stepping in with right foot pivot. Shoot 25, 16-foot jump shots, stepping in with left foot pivot. Shoot 25, 16-foot jump shots, stepping in with right foot pivot. Shoot 25, 18-foot jump shots, stepping in with left foot pivot. Shoot 25, 18-foot jump shots, stepping in with right foot pivot. Instead of flipping the ball to yourself, you now take a couple of hard dribbles and pull up into your jump shot. Shoot 10, 8-foot jump shots, dribbling to the right. Shoot 10, 8-foot jump shots, dribbling to the left. Shoot 10, 12-foot jump shots, dribbling to the right. Shoot 10, 12-foot jump shots, dribbling to the left. Shoot 10, 18-foot jump shots, dribbling to the right. Shoot 10, 18-foot jump shots, dribbling to the left. With this routine, you shoot several hundred shots, including free throws, shots off of the “catch,” and shots off of your dribble. There are hundreds of options when designing a routine. Since every player is different and needs to emphasize different things, you should develop your own specific workout. Now it certainly helps to find a bunch of good workout examples to give you ideas. And you can use those shooting workouts as a base to design your own. But don’t just use a cookie cutter workout. You’ll cut yourself short. Start with some examples, then as you learn, start to design your own custom shooting workout.